First, log into your DreamHost panel. Once logged in, navigate to the MySQL Databases page. 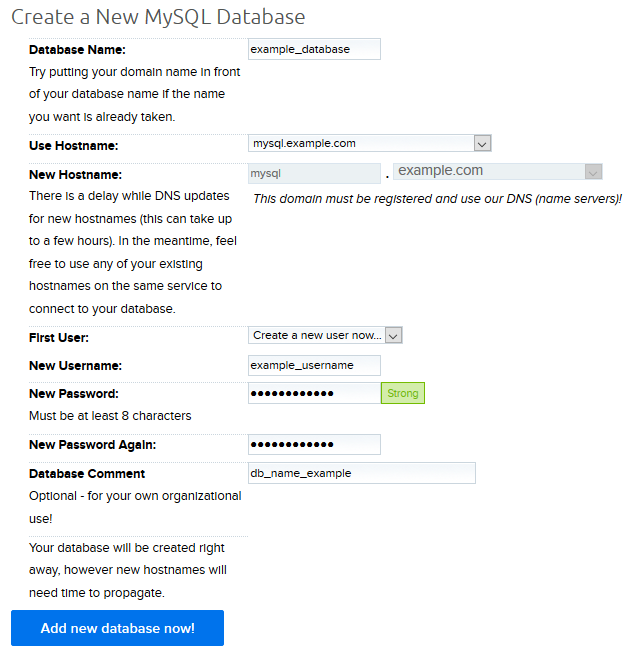 On this page you'll see a full list of your MySQL hostnames and databases. To create a database, scroll to the bottom of the MySQL Databases page and fill out the following fields. Enter a unique name for the database. Database names must be unique across the entire DreamHost system, and can only contain numbers, the letters a-z, and underscores (_). Picking a name that is longer and descriptive is recommended. For clarity, DreamHost suggests putting your domain in the database name such as "blog_example_com" instead of a less clear example of "blog12345". Once you have created the database, you cannot rename it. Here you can create a new hostname or select an existing one from a drop-down menu if any exist. Creating a hostname for each domain is generally recommended to prevent downtime should you remove a domain from your account in the future, and find out that other sites used a hostname on it and no longer functions. Here you can create a new MySQL user or select an existing one from a drop-down menu if any exist. For security reasons, having a MySQL user for each database is recommended so that any compromised site or credentials cannot be used to access your other databases. If you are creating a new user, enter a password for that user here. If you select an existing user, this field is disabled. If you are creating a new user, re-enter the same password as above here. If you select an existing user, this field is disabled. When all required fields have been entered, click Add new database now! to begin the database creation process. Adding new databases or users, changing MySQL user passwords, and deleting databases or passwords generally takes affect within 5 minutes. Newly added hostnames will function for websites within 5 minutes, due to all of your hostnames being written to your webserver(s) /etc/hosts file. Using a new hostname for phpMyAdmin may take up to 4 hours to function due to DNS propagation time. What MySQL server is the database created on if I have a MySQL VPS? How do I merge my databases on to a single server? Article last updated April 08, 2019 21:25 PST.